Not sure when this picture was taken, but it could have been for Clara’s 21st birthday in 1915. I have the cameo brooch she is wearing. I only had one set of surviving grandparents when I was growing up – my Yorkshire grandmother Clara and my Aberdeenshire grandfather James (Jim) – and for much of my childhood we lived fairly close by in Leeds, so I remember them well and fondly. My grandmother Clara was a jolly person, always smiling and laughing. She was a good cook and loved making meals and baking treats for her family, as well as excellent jam from the strawberries and raspberries my grandfather grew on his allotment. Her Yorkshire Pudding was as it should be – light and fluffy, but crisp around the edges. She adored her grandchildren, kept a supply of sweets in her handbag, and loved family get-togethers and days out. Her life was focused on family, home and neighbours: she knew everyone who lived nearby and was friends with lots of them, as well as being close to her nearby brothers and sisters. Her mother lived in the same street after being widowed in 1925, so for over 25 years Clara and her mother were close neighbours. My grandmother’s death in 1965 from a stroke, at the age of 71, came as a huge shock to us all. She was, and still is, very much missed. 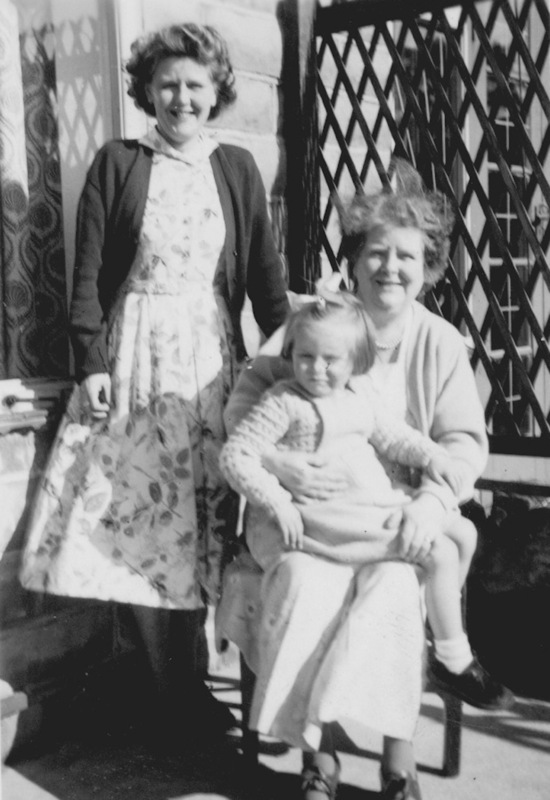 Clara Green was born on 29 July 1894 at Spark Lane, Mapplewell – which I’ve been to see – and at the time her carpenter father was working as a cart repairer at a nearby colliery. Clara was the fourth of eleven children born to Joseph Green and Charlotte Senior, nine of whom survived childhood. She lost her sister Charlotte in 1905 and baby Albert died in 1911. In around 1899 the family left the Barnsley area, where both Joseph and Charlotte came from, and moved to Leeds, living for a few years in Hope Grove, Armley, in a house which has since been demolished. They are there in the 1901 census, Clara age 6 and her father a carpenter. Her father can be found on the electoral roll at 3 Hope Grove from 1900 to 1904. In May 1904, however, Clara’s parents had their youngest three children baptised at St Stephen’s, Kirkstall, and their address at that time was Stack Cottages, Abbey Road, Kirkstall and on the 1905 electoral roll Clara’s father is at a dwelling house at Kirkstall Forge – most probably he was working there as a carpenter. In 1906, however, Joseph Green is on the electoral roll at 7 Vicarage Avenue, Kirkstall, the house in which Clara was to spend nearly all her life. In about 1911 the Green family moved to the bottom of the street and took a larger house at 48 Station Parade, Kirkstall – with nine children and a lodger, they must have needed the extra room. By then Clara was sixteen and working at a nearby mill as a cotton spinner. I’m not sure which mill it would have been, as there were a number of mills along the banks of the River Aire, which formed one of the borders of the parish of Kirkstall. The family moved back into 7 Vicarage Avenue in 1915, and that is the address Clara’s father gave when he did army service with the Royal Engineers at Aldershot during the war. In November 1916 my grandfather, James Fraser of the Gordon Highlanders, was wounded during the Battle of the Somme – he was shot through the left wrist. He was sent to an army hospital that had been set up at the teacher training college at Beckett’s Park, which bordered Kirkstall. On his discharge from the army in 1917 he decided to stay in Leeds and attend a government sponsored training course in order to become a qualified painter and decorator, and he took lodgings at Vicarage View, Kirkstall. James and Clara met, and on 19 July 1919 they were married at St Stephen’s Church, Kirkstall. James and Clara first set up home at 2 Springfield Terrace, Kirkstall, where their eldest daughter Marjorie was born, but moved into 7 Vicarage Avenue in about 1921 when Clara’s parents moved house. My mother, James and Clara’s second daughter Dorothy, was born at 7 Vicarage Avenue in October 1921. Clara was to stay in that house for the rest of her life, and she was a housewife, mother and grandmother, except for a short time during the war when she worked in the packing department of Timothy White’s, a chain of chemists. I suspect she was glad when her war effort was over and she could go back to the life she loved, looking after her family. Only one event today – a Strachan ancestor born 218 years ago. Birth of ggg uncle Thomas Strachan at Gorbals, Lanarkshire, son of my ggg grandparents John Strachan and Agnes Neilson. He married Elizabeth Nisbet in 1816 at Riccarton, Ayrshire and they had 3 children, and the baptism record of one of them says Thomas was of Witchknowe, Riccarton – and today there is a Witchknowe Road in Riccarton, which is south of Kilmarnock. He was, of course, a coal miner. Thomas died in July 1821 age 25, as another researcher informed me – I haven’t seen the record myself. Thomas was the gg grandfather of Scottish athlete Eric Liddell. An ancestor born in 1853 whose photography is online, two deaths of children, and a birthday up in Aberdeen. Birth of James Gilmour Strachan at Riccarton, son of of Robert Strachan and Janet Ross Gilmour and grandson of my gggg uncle Peter Strachan and Mary Monroe. He’s with his parents and siblings in 1861 at Comet Pit House, Riccarton, and with them at 21 Boyd Street, Galston in 1871, by which time James had become a coal miner. In August 1873 he married Susanna Sharp at Loudon but she died in August 1875, again in Loudon. They had a daughter Janet Gibson Strachan who seems to have been brought up by her Sharp grandparents, as that’s who she’s with in 1881 at age 5. In 1876 James married Annabella Rae at Galston, and in the 1881 census they are at Galston, James a coal miner and with 2 children plus a lodger. They are in Bentinck Street, Galston in 1891 with 6 children, and in Henrietta Street, Galston in 1901 with 8 children. James Gilmour Strachan died in 1933 t Henrietta Street, Galston. 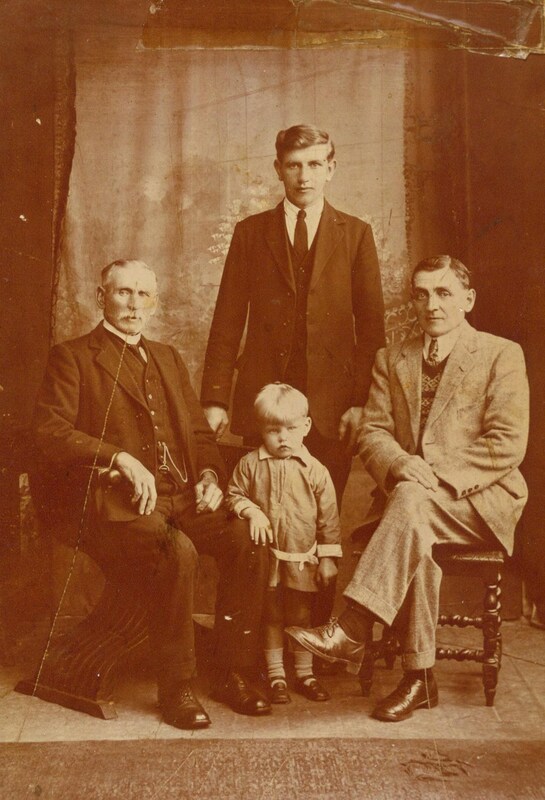 This photo of James Gilmour Strachan, with his son and grandchildren, has been posted on Ancestry, and I have to say he has Strachan characteristics. There is a distinct look of my father about him. Birth of Janet Richmond at Kilwinning, daughter of my half ggg aunt Jean Pollock and John Richmond. Her mother was the illegitimate daughter of Jean Orr who who was the widow of Joseph Haggerty. Janet Richmond died in 1868 at age 7, in Riccarton. I have only just discovered that my great grandparents John McCrae and Mary Ann Mcinairney has a son they named Jacob Owen McCrae born on 14 June 1881 at 40 Mill Lane, Kilmarnock. Jacob only lived for 6 weeks, and died on 26 July 1881 at 40 Mill Lane of scarlet fever. If you worry at a problem for long enough a solution will appear. This has just happened with my McCrae brick wall. My gg grandfather John McCrae was born in about 1839/40, and married Mary Ann Mcinairney in 1861 in Kilmarnock. On his marriage certificate he gave his parents as John McCrae labourer dead and Mary McCrae ms Henderson dead. I found a death certificate for his mother Mary but not for his father. Mary McCrae died in 1860 and her son John gave her parents’ names as John Henderson labourer dead and Jean Henderson ms McCrae. That Mary Henderson married a John McCrae and also had a mother called Jean McCrae is possible, of course, but has always bothered me a bit. But despite a thorough search, I failed to find him or his mother in the 1851 census. It did occur to me that they might have been from Ireland: in the census John McCrae has his birthplace as Kilmarnock except in the 1891 census where it says he was born in Ireland. I don’t know who Martha Todd was but haven’t yet researched her. I have no idea why they are all called lodgers. However, the entry for John has been added in afterwards by the enumerator, so must have been missed off when the enumerator was first copying the individual forms into his book. Very easy for a mistake to have been made, or for him to use ditto marks when they didn’t actually apply. It must be the same Mary Henderson and Susan Bell. John McCrae is listed as age 12 – but could that have been 12 months and not 12 years? Has the enumerator made a mistake when copying the form into his book? I haven’t researched the Lathan family yet, but it seems as if Mary Henderson took in boarders to help provide her with an income. 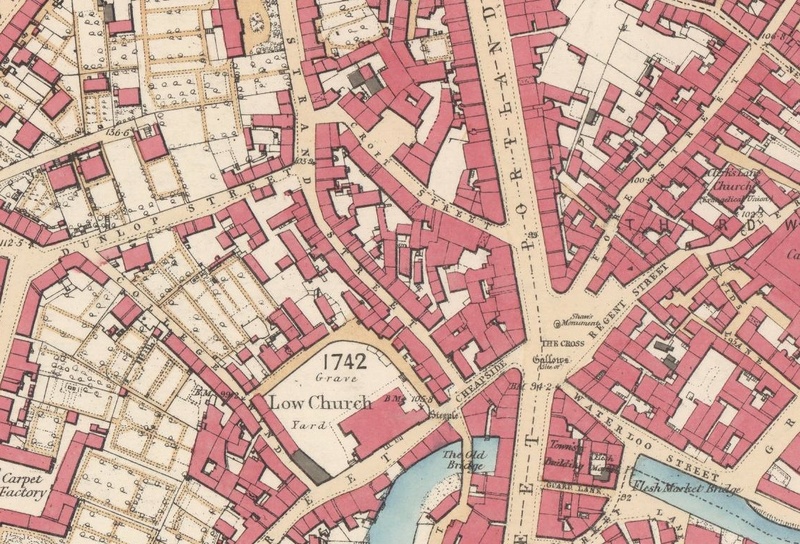 College Wynd is close to Strand Street, where Lawson’s Land was, and is close to Fore Street where John McCrae was living in 1861. So it is looking very much as if gg grandfather John McCrae originated in Northern Ireland, somewhere in Country Antrim, and arrived in Kilmarnock with his mother Mary Henderson when he was only a few months old. 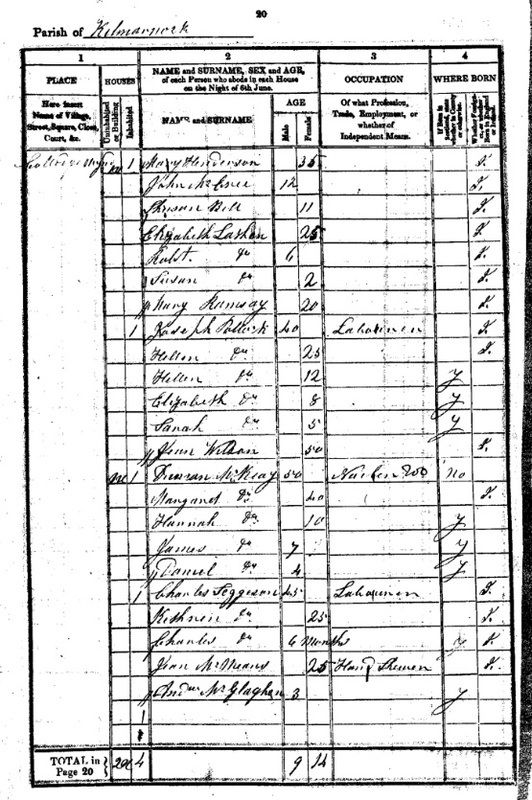 An additional link to these census entries is that in 1850 Susan Bell married Jacob Owens. In 1851 Susan Bell is said to be married, and Jacob Owen was living just a few doors away (and is on the next census page) with his mother and siblings, and his entry also says he is married. Very frustratingly, I’ve been unable to find a death certificate for Susan Bell or Owen/s on ScotlandsPeople, as I’m desperate to know who her parents were! However, during my searches (which were aided by the very helpful Jonn on RootsChat – always a good place to post your problems) I discovered that John McCrae and Mary Ann McInairney had a child born in 1881 who died at 6 weeks old. He was called Jacob Owens McCrae. There is now lots more research to do on my McCrae line, but I need to flex the credit card and buy more credits on ScotlandsPeople before I can go further. It also means research on that line takes me to County Antrim. I’ve avoided delving into Irish records as I know a lot were destroyed, so finding people there is difficult. But it looks like I’m going to have to bite the bullet and have a go. Happy birthday to Nicole in Canada! Nicole shares a birthday with three Ayrshire ancestors, as well as one of my Yorkshire relatives. Birth of John Haggerty at Muirkirk, son of my ggg grandparents Joseph Haggerty and Jean Orr and sister of Margaret Haggerty who married my gg grandfather Robert Strachan. In 1835 he married at Dundonald to someone named, in the OPR, as Mary Googles, and in 1840 a child Helen Haggerty was baptised in Dundonald to John Haggerty and Mary Gogle. 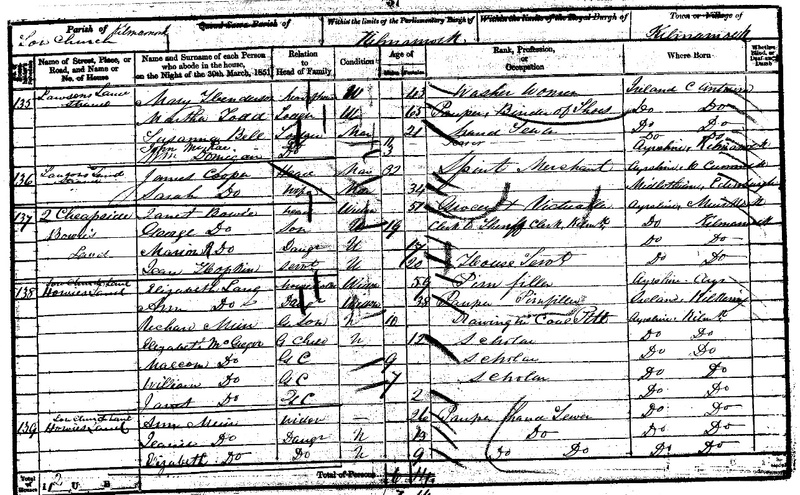 John Hegerty (as it is spelled) is in the 1841 census at Fullerton Street, Dundonald, a coal miner with wife Mary and daughter Ellen. A daughter Jane was then baptised at Irvine in 1843. The family then become difficult to find but I suspect Mary Googles/Gogle was actually Mary Coghill. In 1851 there is a Helen Haggerty age 11 and Jane Haggerty age 7, both born Irvine, living with Daniel Coghill and his sister Mary, again both born Irvine, at Guildry Court, Glasgow St John. There is also a John Haggerty age 3 born Glasgow. Nothing found for John Haggerty born 1812, so it seems he died sometime between 1847 and 1851. Birth of Margaret Sampson Reid Jamieson at Irvine, Ayrshire, who became the wife of my gg uncle Samuel Strachan. Her sister Janet Jamieson married Samuel’s cousin Munro Strachan. Samuel and Margaret had 11 children. Samuel Strachan died in 1877 age 62, and in 1881 his widow Margaret is at Niven’s Land, Dreghorn with a daughter and 2 grandchildren. In 1891 and 1891 she is on her own in Dreghorn, occupation housekeeper, and she died there in 1905. Birth of Margaret Strachan at Dreghorn, Ayrshire, great granddaughter of my gggg uncle Robert Strachan and Jean Kelly. Robert’s son Andrew had a son Robert who was Margaret’s father so Margaret is my 3rd cousin twice removed (phew!). She’s in Dreghorn with her parents and siblings in 1861, and with them in 1871 at 22 Auchenharvie Row, Saltcoats. In 1875 she married John Freeburn (or Freaburn or Freebairn) at Stevenston, and they are at Auchenharvie Row, Saltcoats in 1881 with 3 children. They moved to Glasgow in about 1890 and were in Bothwell, Lanarkshire in 1891 with 5 children. Margaret Freeburn nee Strachan died in 1894 at the age of 38 at Bothwell. Amberson Dennis Athorne was born in 1901, birth registered in Barnsley, Yorkshire, son of John Amberson Athorne and my gg aunt Hester Green. He is with his parents in Carlton in 1901 and at Longcar Street, Barnsley in 1911, his father a colliery fitter’s labourer. 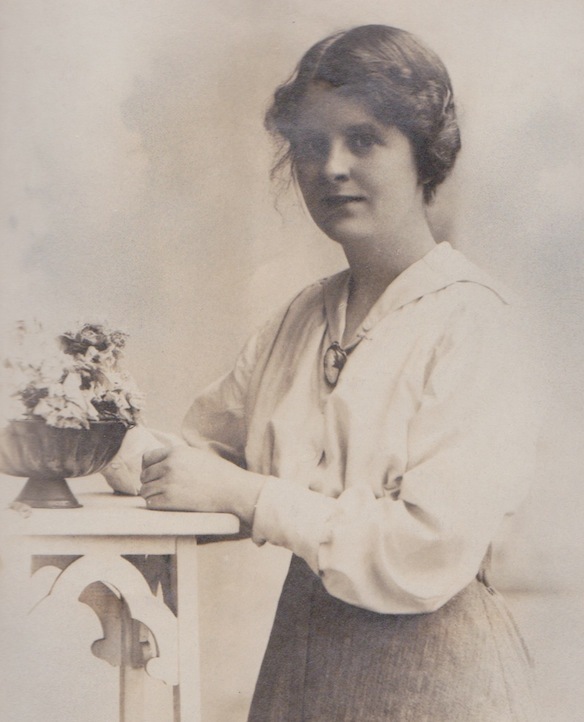 Amberson married Mary Altass in July 1921 in Barnsley but died age 28 in 1929. The birthday girl Nicole was born in Windsor, Ontario, granddaughter of my cousin Colin. Two early ancestors who have proved difficult to trace, and a Watt ancestor from Aberdeenshire who sadly spent the last few years of his life in the Aberdeen Lunatic Asylum. Birth of my gggg uncle Walter Neilson in Govan, Lanarkshire son of Walter Neilson and Agnes Hadden and brother of my ggg grandmother Agnes Neilson. There is a marriage in 1786 at Gorbals of Walter Neilson coal miner and Jane Shiels, and baptisms of 8 children to them from 1787 to 1806 in Gorbals and Govan, with the youngest child baptised in Barony, Lanarkshire. Nothing further found, and he must have died before the 1841 census. Birth of my ggg aunt Agnes Strachan at Gorbals, Lanarkshire, daughter of John Strachan and Agnes Neilson. Her birth entry in the OPR says her father John Strachan is a “coll huer”. I have no idea whether she survived childhood or not as I’ve not been able to find anything further for her. Her parents moved around quite a lot during the years when she’d have been a child, but were back in Ayrshire by the time she’s reached her mid teens. Birth of my gggg uncle George Watt at Udny, Aberdeenshire son of Peter Watt and Helen Alexander. In the 1841 census he is a farm servant, and he married Ann Kenn at Rayne, later that year. In 1851 they at Garmond, Monquhitter, George and agricultural labourer, with 4 children and their birthplaces indicate they’d moved from farm to farm. In 1861, however, George is at Tarves with his brother James and wife Ann and 5 children are at Monquhitter. Something then clearly happened as in 1871 George Watt age 61, farm servant of Tarves, is a patient in the Royal Lunatic Asylum of Aberdeen. His wife Ann is still at Garmond, Monquhitter, a stocking knitter with 2 children and 2 grandchildren living with her. George Watt died on 13 April 1872 at the Royal Lunatic Asylum of smallpox. His death certificate confirms he was the son of Peter Watt crofter and Helen Alexander.